It looks like it's going to be a good day for investors, and an especially good day for Republicans. 1. Midterm election results: CNN projections show Republicans won the balance of power in both the Senate and the House. This gives the GOP control of Congress and the power to pin down President Obama during his last two years in office. Many investors expect that the Republican takeover of the Senate will lead to more pro-business policies, and benefit the energy and financial sectors. 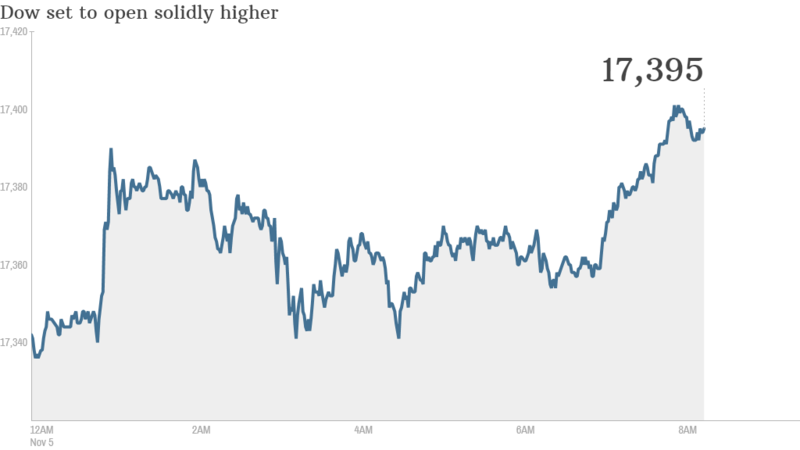 U.S. stock futures were pushing higher before the open with the S&P 500 and Dow poised to jump to record levels. 2. Earnings and economics: Time Warner (TWC), Tim Hortons (THI) and Mondelez International (MDLZ) are set to post quarterly results before the opening bell. Tesla Motors (TSLA), CBS (CBS), News Corp (NWS) and Whole Foods (WFM) will report after the close. Shares in TripAdvisor (TRIP) are getting pummeled premarket -- down 12% -- after the travel website reported worse than expected earnings Tuesday. Competitor Priceline (PCLN) also took a beating in the market earlier this week after issuing a weak forecast. On the economics side, the ADP national employment report for October came out at 8:15 am and said 230,000 jobs were added last month, slightly more than expected. This comes ahead of Friday's highly anticipated monthly jobs report from the U.S. government. 3. European market movers: European markets were all rising in early trading. A stand-out performer was British grocery chain Marks and Spencer (MAKSY). The company reported better than expected earnings and shares shot up by 8%. Meanwhile, Rolls-Royce (RYCEY) shares were edging down by about 1% in London, a day after the company said it was cutting 2,600 staff and appointing a new finance chief. 4. Asian market movers: Shares in Japan's Softbank (SFTBF) declined by 2.3% after the telecom company slashed its earnings expectations for the year, based on its investment in Sprint (S). The struggling U.S. carrier said this week it's laying off 2,000 people, after posting another quarter of massive losses. Shares in Japanese automaker Nissan (NSANY) got a 2% boost after it reported better than expected quarterly results. The weaker yen has helped, making it cheaper for foreigners to buy its cars. Meanwhile, Asian markets ended with mixed results, though the moves were not particularly dramatic. 5. Tuesday market recap: U.S. stocks closed mixed Tuesday. The Dow Jones industrial average posted a gain of nearly 18 points, while both the S&P 500 and Nasdaq slid about 0.3%.